The Grandview Campground in the White Mountains lives up to its name by giving spectacular vistas of the night sky, not to mention huge panoramas of the Owens Valley below. But don't let the beautiful scenery fool you. 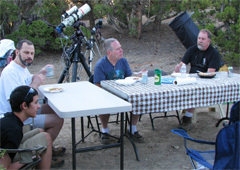 Although the weather at Grandview Campground in June is typically fantastic with warm days and moderate evening temperatures, at an elevation of 8,500 feet and in the shadow of the Sierra Nevada Range, the conditions can be harsh and unpredictable. Come prepared for just about anything weather-wise. 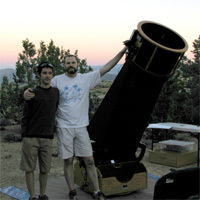 The star party starts on Thursday night, instead of the usual Friday. The campground is about 250 miles away from us here in southern California. The road up the mountain is narrow and curvy in spots. Elevation is about 8,500 feet. There's no running water and only pit toilets. There are no trash bins—take all of your trash with you when you leave. Attendance may be just a small group of RASers so be prepared to support yourself with food, water, and whatever you might need in the way of shelter, sleeping gear, clothing, heat/warmers, etc. 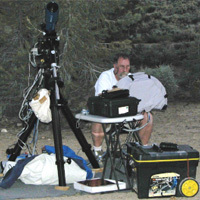 This star party is held on public land in a national forest. Please conduct yourself in a courteous manner and abide by all posted rules and regulations. For more information on the campground, click here. 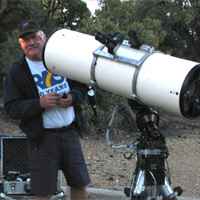 Check out Dave Jurasevich's page on the campground.